Avios and British Airways Executive Club have a new hotel partner – Best Western. You can either earn a flat 500 Avios points per stay OR collect Best Western Rewards points as usual and then convert them into Avios as a lump sum. You can credit the points to any Avios scheme – avios.com, BAEC, Meridiana Club, Iberia Plus or AerClub, plus Vueling Club from 10th October. 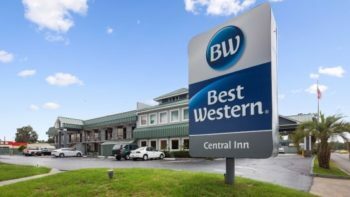 When I ran a reader survey a couple of years ago on which hotel chains you used, Best Western performed surprisingly strongly. Now that you can earn Avios with them it is worth knowing more about Best Western Rewards, especially as they have a generous status match scheme. The Best Western brand covers 4,000 hotels worldwide in 80 countries. What differentiates the group from chains such as Hilton is that every hotel is independently owned and managed and they are given far more leeway in terms of how they operate. The hotels are generally smaller in terms of room numbers than you would find from the bigger chains and the average rating is probably around a three star. Today there are 250 Best Western hotels in the UK (website here) and six global brands – Best Western, Best Western Plus, Best Western Plus Executive Residency (long stay), Vib (a new boutique hotel concept), Best Western Premier and BW Premier Collection. Gold – requires 10 nights, 7 stays or 10,000 points. The only benefit is a 10% points bonus. Platinum – requires 15 nights / 10 stays / 15,000 points per membership year – Gold benefits plus room upgrade and recognition gift. Points bonus is 15%. Diamond Select – requires 50 nights / 40 stays / 50,000 points. Diamond benefits plus a 50% points bonus. Status runs on a calendar year basis. Once you hit the target for the next tier, you are promoted immediately and retain it for the rest of the current calendar year and all of the following year. You can retro-claim points for stays from up to 30 days before you joined, so you haven’t necessarily missed out if you had a recent stay and were not a member at the time. You will earn 10 points per $1 spent on your entire bill when paying eligible rates. You do NOT earn points on restaurant charges or anything else charged to your bill apart from the room rate. You can earn points on up to three rooms per night as long as they are all booked in your name and you occupy one of them. Alternatively, you can take airline miles. Both Avios / British Airways and Virgin Atlantic offer 500 miles per stay. A list of other participating airlines can be seen in the dropdown menu on the sign-up page – it includes American (250 per stay), Lufthansa (500) and Flying Blue (250) amongst other. You cannot transfer points from American Express in the UK (you can in some other countries) and there is no UK credit card. There are a variety of hotel and non-hotel rewards options as you can see here (log-in required). 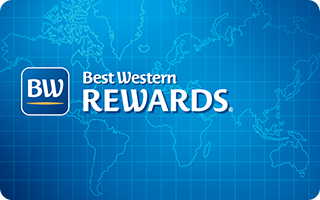 Best Western Rewards points do not expire so you don’t need to hurry to use them. High Street and Amazon vouchers are priced at £5 for 2,000 points. Given that this would require $200 (£150) of ex-VAT spend, you are looking at a 3.3% return. This is not great, although it improves if you have status, and is only based on your room rate and not incidental spend. Other reward options are available but you might as well take a gift card which is close to getting cash. Free room nights in the UK cost between 8,000 and 36,000 points. As a Blue member you are looking at spending, before VAT, £595 to £2,650 to earn a free night worth, say, £75 – £200. This is not a bad return if we assume you are getting 7%-8% back on average. Free nights in overseas hotels start at 4,000 points. These must be booked via telephone. Note that, if you’re looking for free room nights, Best Western UK is a Tesco Clubcard partner. Roughly 2/3rd of the Best Western properties in the UK take part. You can redeem your Clubcard vouchers for free rooms, all with breakfast (which you don’t get if you use points for free nights) at 3x face value. More information can be found on the Clubcard website here. You can convert points to Avios … but is it the best option? You can also convert your existing Best Western Rewards points balance into Avios. 5,000 Best Western points will get you 1,000 Avios. You should compare Avios with other redemptions though. 5,000 Best Western Rewards points will get you 1,000 Avios or £12.50 of John Lewis / Waitrose or amazon.co.uk gift voucher. This means that you are ‘paying’ 1.25p per Avios and I think that is too much. If Avios is your goal, you need to have a think before each Best Western stay – should you take the fixed ‘500 Avios per stay’ or you should you take the points and convert them later? For cheaper stays, take the fixed 500 Avios. The break-even point is a total stay cost (room only) of £222 for a Best Western Blue member. Take a £222 room bill, strip off 20% VAT, convert to $ and you get $250 which is 2,500 Best Western points which is 500 Avios. If your room bill is a lot more than £222, take the points and convert. If it is a lot less, take the fixed 500 Avios points. For clarity …. you CANNOT convert lump sums of points into Virgin Atlantic or any other airline scheme. They only appear to allow this for Avios, and you cannot do lump sum transfers online at the moment. Best Western has a generous status match policy. If you have status with any other hotel chain, it will be matched. A couple of years ago I tested their responsiveness by sending a copy of my IHG Rewards Club Platinum statement (this was before Spire Elite became the top tier) to the UK office. It took 10 calendar days to receive an email confirming my match to Diamond status. The form you need to send them can be found on the Best Western website here (PDF). You can also match Virgin Flying Club status. A Virgin Silver will receive Best Western Platinum whilst a Virgin Gold receives Best Western Diamond. Full details are on the Virgin website here. Best Western Rewards is a decent scheme but not a hugely exciting one. It is hampered by the very loose relationships between the group and its properties and the very varied nature of the hotels, which makes standardised benefits impossible. It is worth taking the chain more seriously now that you can earn Avios, however. If your travels take you to occasional Best Western properties, my suggestion is to get a status match – the benefits are modest but you will be front of the queue for upgrades. You should then take the flat 500 Avios or Virgin miles per stay as your reward unless you are running up large room bills or are confident of eventually earning enough points for a free night. I would think twice before converting lump sums of Best Western Rewards points into Avios, because you are ‘paying’ 1.25p per Avios compared to redeeming for Amazon or John Lewis / Waitrose vouchers. That is not a great deal in my view. Should you dump your free BA Amex for the new Amex Rewards card? Possibly. I matched Hilton Gold to BW Platinum last week. It took BW 4 hours to respond to my scanned letter to status match. While good news I would have a word of warning. The “rewards” of status with BW are inconsistent to say the least. At the same hotel I sometimes get a welcome pack (of a bottle of water and a chocolate bar) sometimes not. Room upgrades are few and far between, so the only real reward for status is the increased points you get. But if you are collecting airlines these are at a flat rate irrespective of status. It’s a rewards system which makes little sense, unless it’s the cheapest or only option. The FF points at least are useful. OT: Back in early August I flew with BA and spent £6 on their BoB. Their tablets didn’t work and they were issuing those old time paper slips with hand written card number which I had to sign for and I quickly forgot about it. Last week I cancelled my BA Amex which I used for this payment and today Amex emailed me that they were unable to process BA High life charge from 26 Sept (today’s date) as the card is cancelled. Do I ring Amex to put the charge on one my other cards or ring BA and give them another card number or just let it go hoping BA won’t chase the £6? I status match IHG to BW before a recent trip to Hong kong where i was staying in a Best Western . There was no mention on my Diamond status at check in , so i thought i would casually drop that in to conversation (always pretty embarrassing having to do that) . The guy on reception was completely bemused by me mentioning ‘Status’ and no upgrade or ‘perks’ were given , i actually ended up with a very small room . I know very little indeed (nothing !) about Star Alliance earning or redemption or even the airlines involved !! However I have a need to get to Hurghada and notice that TK fly there. What’s the most efficient way of using Amex MR points to get to Hurghada ?! Anyone in the know ? !